Social Entrepreneurs from across Europe gather to the Conference Social Solutions by Social Entrepreneurship 12–14 September 2018. Social Solutions by Social Entrepreneurship will look into a number of current issues related with work integration and social inclusion of people in a vulnerable situation. These issues need to be addressed all over Europe because one person out of six has some kind of disability originating from a sickness, an accident, lack of education, or brought on by aging. More specifically, we will look to solutions for people who have a history of substance abuse, who are homeless, who are immigrants in a new society, or who have mental health problems. Social Firms Europe CEFEC has for more than 30 years successfully promoted social inclusion by work. SFE CEFEC is the only network of Social Firms across Europe. Social Solutions by Social Entrepreneurs is the 31st Annual Conference for SFE CEFEC. The conference is organized by Swedish Rysseviken AB in close cooperation with the Finnish Vates Foundation. This year we will have a look into a number of current issues that need to be addressed all over Europe. Some of the solutions will, quite naturally, mostly apply to specific local conditions. However, each one of them can offer a good model that can be modified and used by many different actors in different environments. This year will also focus on the special topic of social solutions worked out by Nordic actors – famous for the welfare society. The Conference is organized with plenary sessions, panel discussions and Parallel Presentations with discussions addressing major topics: Social economy and social entrepreneurship; Housing solutions for homeless people or people who for one reason or another don’t have an own appartment, help to beggars, NEETS qualification within social enterprises, Recycling business as a showcase for circular economy and Migrant integration in Europe. 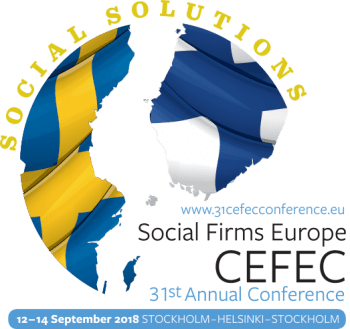 The 31st Annual Conference of Social Firms Europe CEFEC takes place on the luxury cruise ship Silja Symphony travelling from Stockholm, the capital of Sweden, to Helsinki, the capital of Finland, and back. Boarding starts on Wednesday 12th in the harbor in Stockholm, where the Opening Ceremony takes place. Later on the ship leaves for Finland. On the Thursday 13th we arrive in Helsinki, where The City of Helsinki is hosting a reception for the conference in the Banquet Hall. The ship leaves for Stockholm in the afternoon and arrives in the morning of the Friday 14th. Much of the conference will be spent networking with international colleagues during three interesting days on the cruise ship. The event is for all who are interested in the possibilities of Social Economy. You are most warmly welcome to participate in the conference. We look forward to networking with you and showing you plenty of social solutions in September! Participation fee is all inclusive, it covers program, both aboard and ashore, cabins and all meals on the cruiseship (breakfast, coffee and snacks during breaks and dinner). The difference in participation fee is due to choice of cabin and whether the participants register as early-bird participant and is or is not a member of Social Firms Europe CEFEC. Register for the Conference. Early Bird-price was offered until 15.7.2018. Participants outside EU-countries. Please note that if you do not have an EU passport and you want to travel to Sweden and Finland, you may be required to have a valid visa to enter the country. In some countries, the type of your passport can also determine whether you need a visa; for instance, a holder of a biometric passport in many non-EU European countries is not required to have a visa. Please check if you need a visa from the attached page well in advance to allow you the time to obtain the visa, if needs be, prior to the conference. Rysseviken AB is making an effort to make it easier to attend the conference for organizations or companies with very limited economical resources. You may apply for a grant that make your participation possible be sending your application to an e-mail adress we will provide soon. Please note that the time difference between Sweden and Finland is one hour. The cruise ship will leave from Stockholm on Swedish time, arrive in Helsinki in Finnish time, which is one hour later. On the return trip the ship leaves Helsinki in Finnish time and arrives in Stockholm in Swedish time, which is one hour earlier. The program follows Swedish time Wednesday 12th, Finnish time on Thursday 13th and again Swedish time on Friday 14th.